This resource includes EVERYTHING you need to teach children their letter names and sounds. Alphabet centers made with boys in mind. If you are struggling to get your son or male student interested in the alphabet letter name and sounds this pack will get them excited. 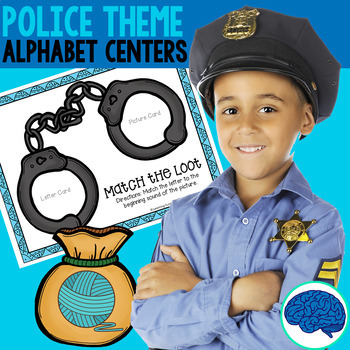 Perfect literacy activity to put in your centers when doing a community helpers theme. Student will design their badge that they can wear while playing the centers. The Book’em file is a cover for the book’em file pages. 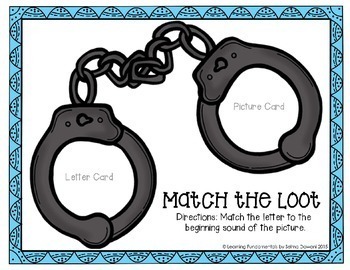 Student will match the picture and letter loot cards using the handcuffs to place the loot. 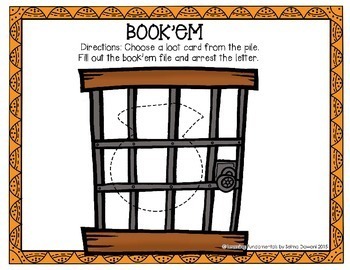 Student will choose a loot card and then use the pages in the Book’em file to “book” by writing the letter, copying a word wall word that starts with the letter and finally stamping the letter. Then the student will place the loot card in jail. If just learning the letters, use the letter loot cards. 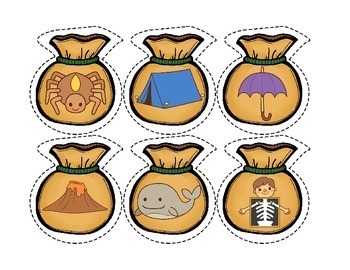 If the student is good at recognition and working on sounds then use the picture loot cards. The two book’em files differ, one of them has a “match” option, where the student will also match the letter and picture card. Student will choose a letter/picture loot card (depends on if you are working on recognition or sound) and then match the suspect on the sheet. Student will then color in the correct suspect.